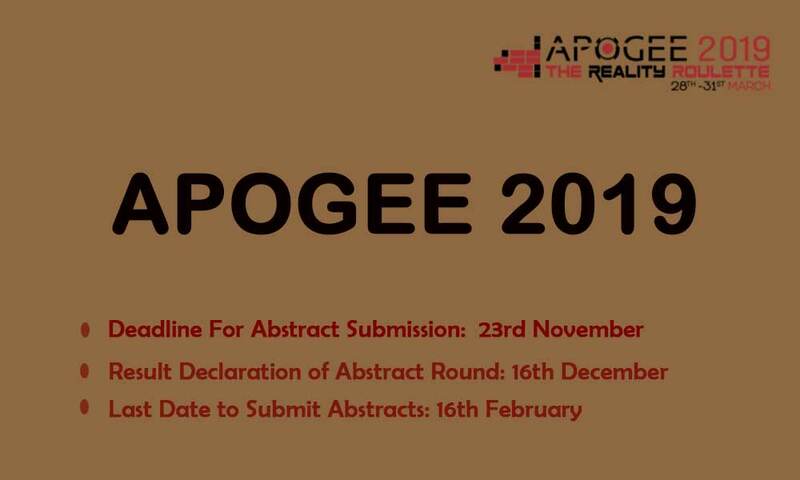 The paper presentation event, APOGEE 2019 will be conducted from 28th to 31st of March 2019 at Birla Institute of Technology and Sciences, Pilani. India's oldest and most prestigious undergraduate research-based event is back with the paper presentation. It’s time for innovative ideas and research work to take the centre stage. Deadline for abstract submission is 23rd November. The results of the abstract round will be announced by 16th December and the last date to submit abstracts is 16th February. The event will be conducted from 28th to 31st March of 2019 at Birla Institute of Technology and Sciences, Rajasthan. We request you to start uploading your abstracts and adhere to the deadline. You can visit the rules and regulations tab on the portal to know about the formats in which one can submit their abstracts. Please feel free to contact us at pep@bits-apogee.org in case of any queries.